A good sense of fashion is one of the pieces that make an ideal man, and there is much to be said about this subject. Whether you want to redesign your look completely, acquire a few tips here and there to spruce up your image, or are looking to buy a meaningful present for your worse half, you came to the right place. This list combines both modern and old-school styles, and you will surely find something interesting. But, clothes are not everything. We aim for this list to be all-encompassing. As such, books on mannerisms, different styles of grooming, and even tattoos will be covered. The aim of this is to distill the essential characteristic of men’s style, and with the authors’ help, you will bring yourself to another level in no time. Without further ado, here is a list of 13 best books on everything modern men need to know about style. Coming in at the top of the list, this book will be appreciated by anyone who is even remotely interested in style and dressing well. 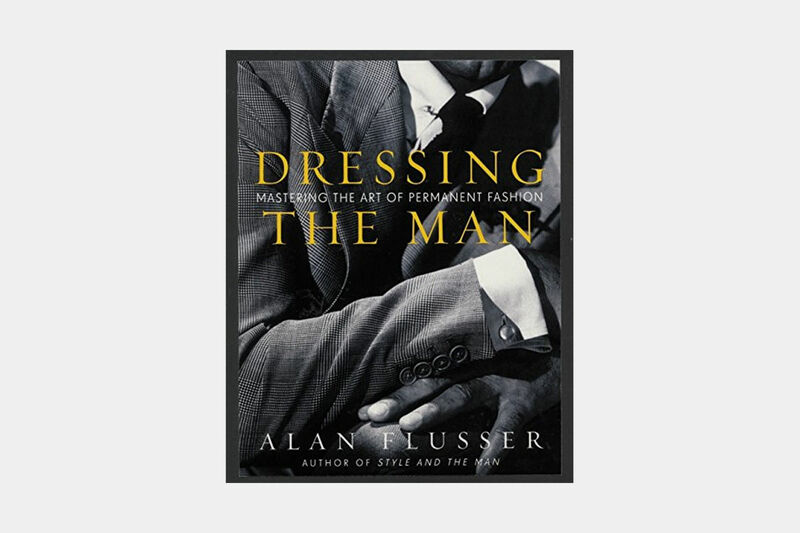 In this book, Alan Flusser attempts to once and for all show us the proper guidelines of being a well-dressed man. You are in good hands with this book as Mr. Flusser possesses a vast knowledge on the topic of men’s clothes and is able to deliver the information in an easy-to-read and elegant format. Why is it that today there’s an ever growing number of badly dressed man? Flusser claims that dressing well stands on two pillars that many of us are completely ignoring: color and proportion. His concept of permanent fashionability runs against the usual, seasonally delivered, fashion tips. In this book, you will acquire his personalized instructions: what clothes will suit YOU the best, based on your physical trademarks. And once you know how to do that, you will be able to transform your style drastically. But this is only the beginning. This book will take you through each clothing classification from business and formal up to casual style, so you will be prepared for every situation. The book features plenty of photos, many of which have never been published elsewhere, to offer us a large and diverse collection of men’s styles. If you were to buy only one book to better your style, this is the one. This book is aimed for both complete beginners and fashionable connoisseurs. It is designed to be your go-to savior in any situation. It will cover every part of your closet. Inside, you will find the information you need on men’s suits, trousers, jackets, boots, and even gloves and hats. It covers everything from dressing up for formal meetings to informal gatherings and creating an interchangeable wardrobe. For readers on a budget, there is also a part on shopping for casual wear. The book is filled with unique illustrations that make it easier to find what you are looking for. Dress Like a Man will surely teach you how to use clothes to your advantage and become a truly fashionable man. COOL is a book about style but is also much more than that. It is an exploration of what people found to be cool during different time periods and how it changed through the decades. It offers a deep dive into many subcultures, plenty of which are unknown to the mainstream but that made a significant impact on us. Therefore, it reads more like a fascinating historical and anthropological study. Ranging from greasers of the 1950s to glam rock of the 70s to the club culture of the 80s to today, it shows how rebellion and non-conformity challenges and, sometimes changes the mainstream culture. Filled to the brim with original illustrations, COOL will give you a thorough and vibrant picture of many different movements and their clothing styles. If you have any interest in things that shaped our cultures into what it is today, you shouldn’t miss this book. A well-groomed beard is an important part of being a stylish man. In this book, Allan Peterkin shows us, in a witty and engaging way, the rich history of men’s facial hair. It offers many different styles to choose from and information on how to properly care for your facial hair. It is rich with pictures of famous bearded men and, for the fun of it, women. Aside from the technical side, this book also goes into the cultural significance of various types of beards, ranging from ancient Egyptians up to the present day. One Thousand Beards is an educational and light-hearted grooming book that will make you laugh out loud while simultaneously pondering your next facial hair masterpiece. Men and Manners contains a list of short essays, guidelines, and interviews designed for men of all ages. Written in an honest and humorous manner, it is a much-needed reminder of some of the rules of civility that you may have forgotten. Topics that are explored in this book range from texting to dating to grooming to toasting and office behavior. All of the insights are delivered in a humorous way with a combination of wit and self-deprecating attitude. Men and Manners is filled with hilarious illustrations that add to the light-hearted read. It is a book you will learn much from and one you will want to keep coming back to. Ever wondered just how much work goes into every pair of the jeans you own? In this fascinating book, Nick Williams aims to deconstruct everything that happens in the process of branding a pair of jeans. The story of this book is told through a series of inspiring and beautiful photographs with each of them further illuminating the interesting history of denim from the 1870s up to this day. Williams went through the archive departments of Lee Jeans, Levi Strauss, and other famous denim brands to deliver a truly mesmerizing tale. Denim Branded delivers answers to everything you might be wondering, and then some. For a long time, Italy has been highly regarded in the world of fashion, and in this book, you will discover exactly why that’s the case. The author, Hugo Jacomet, takes you behind the iron curtain and into the heart of Italian elegance. To do that, this book focuses on the master tailors and artisans who have been working on this craft for generations. Hugo Jacomet is a famous industry insider and one of the most knowledgeable people in the field of men’s fashion. The Italian Gentleman is a truly an epic tale. With its broad brush, spanning from the Alps to Sicily, it documents the craftsmanship behind the most elegant gentlemen. The book includes more than 50 houses that are celebrated for their commitment to upholding the best parts of Italian traditions. It is a richly illustrated adventure that will make you appreciate Italian fashion to the fullest. Consider it essential reading if you’re interested in the roots of modern style. If you are a fan of vintage style, this book is for you. Vintage Menswear displays a huge collection of rare 20th-century clothing that designers and stylists usually pay to view to gather their inspiration. The book features 130 highly influential examples from American, Asian, and European design. It is comprised of three sections: workwear, sportswear, and militant clothes. It covers everything imaginable – from 1940s polar exploration suits up to vintage denim. With over 300 pages that are most lavishly illustrated, this book offers an amazing alternative to the usual, conservative men’s style books. In this book written by Jurgen Blumlein, we are looking at how skateboarding influenced the popular culture. Clothing that was created specifically for skateboarding was more and more embraced in the past 50 years. The story of skateboarding spans from the 1950s to today and is told from the perspective of designers, pro skateboarders, and everyone who has helped to define the skateboarding look for entire generations. This book is an in-depth and fascinating look into the ever-growing skateboard scene. Every clothing item you have in your wardrobe had to start somewhere, and that is what this book is about. Josh Sims does an excellent job of pinpointing the crucial icons of men’s style as well as giving us the detailed history of design and which particular companies shaped the way men dress today. This book is filled with photos of stunningly dressed men, many of them being classic film stars. Aside from clothes, it also covers watches, hats, and sunglasses, so everything you want to wear is covered. It just waits for you to dive in. This is a story about a man named Stan Smith, a celebrated icon from the world of sneaker design and a professional tennis player. In the 1970s, he designed what soon became the best selling Adidas sneakers. The book proceeds to go very in-depth with recollections of the man himself and the countless anecdotes from designers, style influencers, sports legends, and even some sneaker fans who knew or were influenced by him. If you are in any way interested in the culture of Adidas sneakers, sports, and pop culture, this book will be a perfect read for you. Here we have an in-depth look at the development of urban street culture from its slow beginning in the ‘90s up to the present day. It shows a change in mindset, where brands became more open-minded and started to collaborate with music icons to create original clothes, watches, sneakers, etc. Highsnobiety is a lifestyle publication that is at the top of this phenomenon that has taken over the whole globe in its frenzy. This book contains the very best and most popular pieces and brands from the world of men’s fashion. If you want to know what’s up in this side of culture, this guide is designed for you. Mr. Porter is the online retail website that offers more than 170 of the leading men’s style brands and is also a place to find information and guidance on the topic of fashion and lifestyle. This book is a culmination of the most essential advice to men. Inside, you will learn, for example, how to appreciate jazz and get out of a hair rut. It offers many fashion recommendations, insightful commentaries, and insider information on various polo shirts, knitted ties, sweatshirts, and more. Filled with nearly 200 illustrations, The Mr. Porter Paperback will show you what it means to be a stylish man.